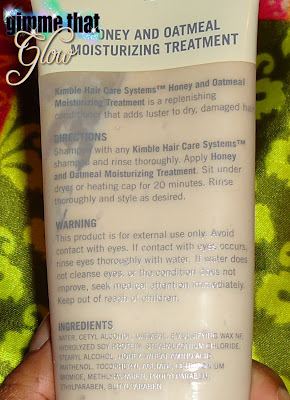 If you've never tried a product from Kimble Hair Care Systems, then its time to get familiar! Kimble is a hair care line developed by celebrity stylist, Kimberly Kimble. They offer a very extensive collection of products designed to accommodate all of your hair care needs. I recently tried Kimble's Honey and Oatmeal Moisturizing Treatment which is a replenishing conditioner that adds luster to dry, damaged hair. Whether you're permed or natural, having a good conditioner is an integral part of maintaining healthy hair. Within the last couple of months I've tried quite a few products on my natural mane, a few of which left my hair feeling weak and dry. My scalp was definitely overdue for a little TLC. I'll admit, I tend to go against the grain when it comes to following directions, which is why the first time I used this product I failed at seeing the maximum results in which it could've offered. The first time I tried the treatment I combed it through my hair after washing and rinsed immediately afterwards, BIG MISTAKE. The instructions clearly state that after applying the treatment you should let it sit for 20 minutes while under a dryer or using a heating cap. I decided to give this product another go and this time I did just as the instructions stated. If you don't have a dryer or a heating cap, a regular shower cap will suffice just the same. In the above photo is my hair right after applying the treatment and just before putting on the shower cap. The photo below shows the results of my hair 20 minutes later after removing the shower cap. I noticed an immediate difference. I could actually comb through my curls they seemed more manageable and they felt really smooth. Glow: I really loved the way it felt as I rinsed it out of my hair, it was really smooth and my hair felt like silk. I could run my fingers through it without running into tangles. Glare: When I see the words Oatmeal & Honey I instantly think " that must smell really good! " Well, while it does have a pleasant smell its way more faint than I expected it to be. I would've loved for it to have had a more significant scent. Would I Recommend It: Absolutely! Its refreshing to find a product that can revitalize your tresses in a simple step! Overall Glam: Its a really good treatment that can also double as a deep conditioner. It left my hair feeling super smooth and replenished! You can try out the product yourself and purchase it directly from Kimble, its also available in various stores such as Target. Products in this post were provided for review. Read our disclosure policy here.